This page lists several live traps that can be used for catching roof rats or norway rats. They each have certain qualities or features which might make one better suited for your application over another. The list will start with smaller, less costly models and progress to the best, highest quality traps available. The first models will be single catch traps; the last few models will be multiple catch or repeater type traps. 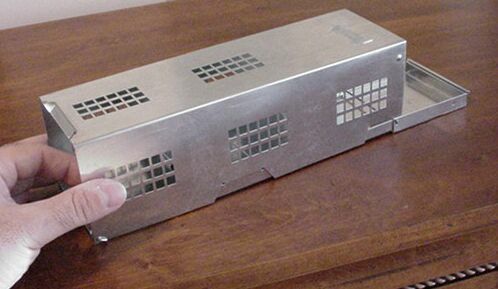 RAT TRAP FEATURES: Live trap which measures 3" tall by 3" wide by 10" long. It is constructed of sheet metal and has a trip pan in the mid section which closes the entrance door when targeted animals enter. It also features a rear hinged door which is ideal for easy baiting and animal release. In the picture above, the entrance to the trap is on the left side where you see the hand; the rear door on the back of the trap is set to the down position which is on the right side of the picture. Use this trap only if you're unsure if you have mice or rats. This trap will work well on young and small rats as well as mice. 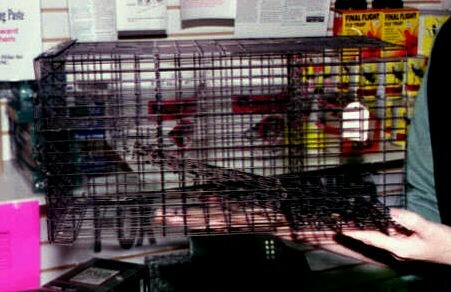 However, large rats will need to be trapped with bigger traps as featured further down this page. RAT TRAP FEATURES: This Green Live trap is ideal for problems where you want to hide the trap in the landscape. It will catch small animals like chipmunks or rats. It's green color makes it easy to hide in the yard when trapping outside. It has a 1/2" by 1" mesh so it can hold most any small animal including flying squirrels or rats. RAT TRAP FEATURES: This trap features high quality craftmanship and is built to last. Commonly used by professionals, this trap also has a "locking" front door which enables it to stay closed when animals are caught. It uses 1/2" x 1" wire and is built tight around the front door so it's sure to hold small animals like rats and flying squirrels. RAT TRAP FEATURES: This trap features high quality craftmanship and is built to last as well. Commonly used by professionals, this trap also has a "locking" front door which enables it to stay closed when animals are caught. It uses 1/2" x 1" wire and is built tight around the front door so it's sure to hold small animals like rats and flying squirrels. This trap also features a sliding rear door that makes animal release, trap baiting and trap maintenance easy. 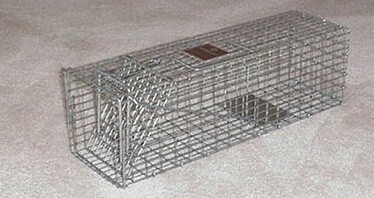 RAT TRAP FEATURES: 18"L x 6"T x 6"L. Heavy steel frame with 1/2" mesh wire makes this the choice for commercial trapping. It will outlast most wire traps that don't use any metal frames. The unique "U" link allows you to adjust the trip setting. Widen it for light sets, clamp it slightly shut to make the set heavier. RAT TRAP FEATURES: This is a unique trap in that it can catch many rats or other small rodents with just one set. Built with 1/2" x 1" mesh wire, it features two one way doors. Animals enter the trap by passing through the first one way door. This brings them to the front half of the cage. Once in this section, the animal has only one way to go and that would be through the second one way door. Once it passes this second door, it will be in the second half of the trap where it will remain until you want to release it. This trap can hold many squirrels, chipmunks or rats. 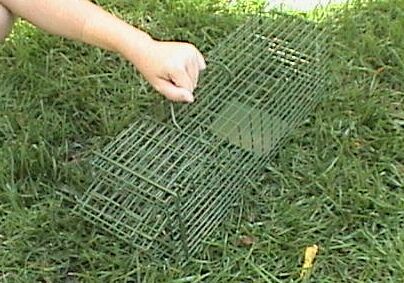 They will tend to collect in the back section of the trap the longer they remain in the cage. 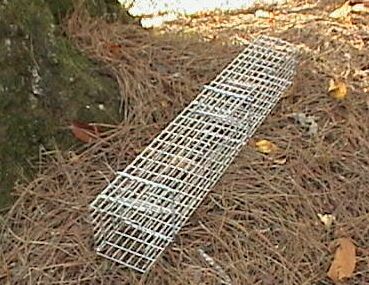 RAT TRAP FEATURES: This is a unique trap in that it can catch many rats or other small rodents with just one set. Built with 1/2" x 1" mesh wire, it features two one way doors and one sliding door. Animals enter the trap by passing through the first one way door. This brings them to the front half of the cage. Once in this section, the animal has only one way to go and that would be through the second one way door. Once it passes this second door, it will be in the second half of the trap where it will remain until you want to release it. The third or last door is on the back side of the second half and allows the user to easily slide it open to release trapped animals. This trap can hold many squirrels, chipmunks or rats. 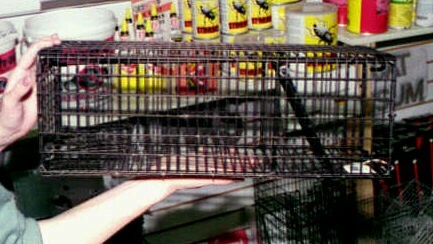 They will tend to collect in the back section of the trap which makes for an easy release with it's rear sliding door. RAT TRAP FEATURES: This trap is made from wire and measures 15"L x 8"T x 8"L. It has an entrance door which acts like a see-saw. This door will tip open so small animals can enter. Once inside, the door will close. Other animals will be able to enter as well. The entrance has an adjustment which can be set to close the door quickly. This could become important in some cases where animals learn to exit as others are entering. There is a removal door which can be used to remove trapped animals or to bait the holding area. Use this design if you are able to inspect the trap daily. If animals are left in the device for long periods of time, they will likely figure out how to escape. Very handy for large populations as you can expect to catch several a day. 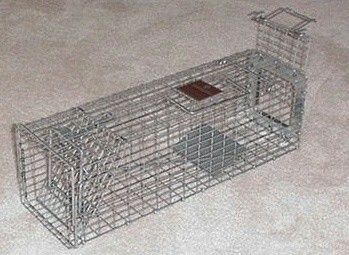 RAT TRAP FEATURES: 1/2" wire design which measures 30"L x 8"T x 8"W. Like the NH8816, it has a see-saw door for entry. However, this design has two doors. They are adjustable and the entry hatch on top allows for easy animal removal and trap baiting. For best results, inspect it daily to insure trapped animals are not able to learn how to exit the device. Great to use in commercial environments where there are a lot of animals which need to be trapped.